Simple truth – sweet potato is a very, very delicious food! And, it is so easily tranformed into a delicious meal – the perfect ingredient for a lazy cook! For example – assuming you want dinner ready in 20 minutes (portions for three people) – take 300g of sweet potato (around 2) and 300g of cèpe (a French name for a very special boletus – yellow boletus). Also you need 3 shallots and as much fresh parsley as you want. First peel and cut the sweet potato into thin pieces – around 0.5 to 1cm thin. Put the peeled and cut potato into boiling water and leave it for 3 minutes. Afterwards discard the water and keep the potatoes at the site. Clean the cèpe and cut it. Peel the shallots and cut them as well. In a pan first heat olive oil to maximum until it starts frizzling. Then add the shallots. Reduce the heat to medium and fry the shallots untill they become glazzed. Heat them a little bit more until they start turning slightly brown and add some salt as well as the the cèpe. Fry the mixture at medium heat for an additional 5 minutes. Constantly stirr the mixture. Then, add the sweet potato and parsley. Fry for another 3 minutes. Voilá! Ready is your meal. And now comes the little extra trick. 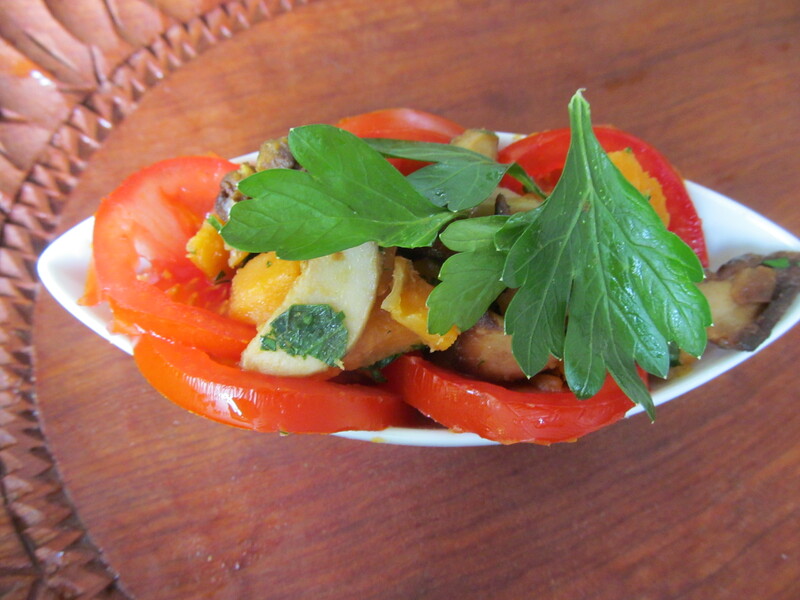 If you want to go for a wholesome tasting food, place the potato-mushroom mixture onto a bed of tomatos. Simply, cut tomatos into disks (around 6 for 3 people, i.e. 2 per portion) to cover a flat plate with them. 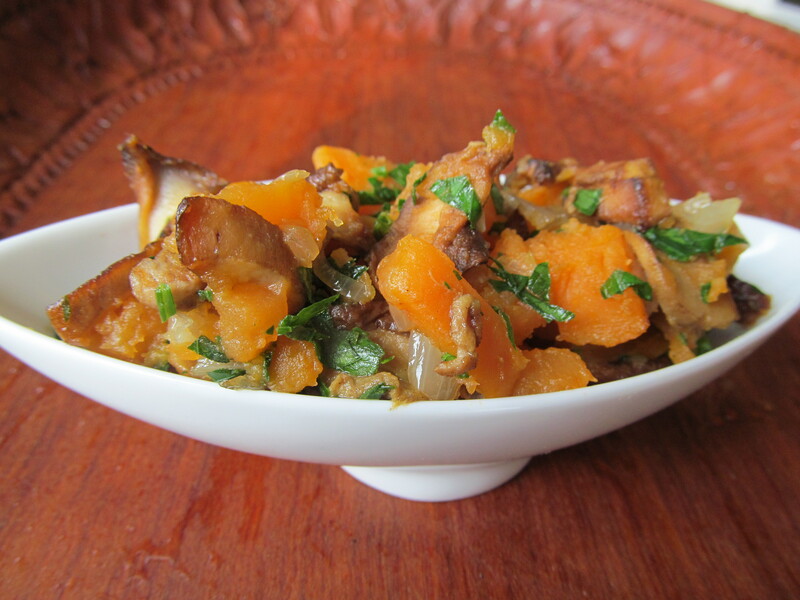 Spread a little bit of olive oil and salt over them and cover them up with one portion of sweet potato with mushrooms. You will see, it tastes like heaven!! As mentioned, this really is the simplest and quickest version of a classical combination. If you want to pimp it up a little further, I would like to recommend you for example broccoli as additional ingredient (see for example Cauldron and Cupcakes’ post) or the addition of a wider range of fresh herbs.